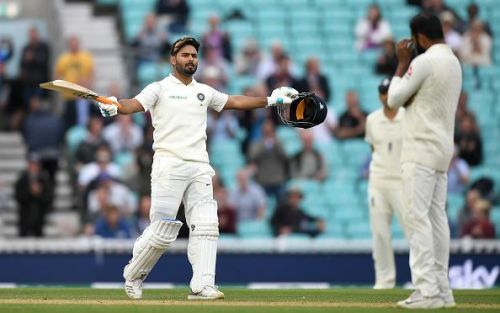 Rishabh Pant, who made his debut in the third Test, has scored his maiden century against England in the final Test. Rishabh Pant came into bat when India lost their fifth wicket for just 121 runs. The 20-year old wicket-keeper batsman had an able support on the other end in the form of KL Rahul. From being the second fiddle in the partnership, Pant turned into the aggressor of the two batsmen after reaching his half-century. After reaching the fifty mark from 78 balls, Pant took just 39 balls to reach his maiden century in Test cricket. He scored his maiden century off just 117 balls, one less than his partner, Rahul. After Dinesh Karthik's failures in the first two test matches, Rishabh Pant was handed the Test cap by the Indian captain. The southpaw became the 291st player to represent India and he was the fifth-youngest wicketkeeper to represent the nation. Pant started his Test career in a great manner as he scored a six off the very second ball that he played. Nonetheless, the bright start did not translate to great performances in the first five innings of his career but he rightly turned his A-game on in the final innings of the England tour. With the series already lost, India are facing near-impossible target of 464. India got off to a bad start as they lost three wickets for just two runs but a 118-partnership between KL Rahul and Ajinkya Rahane took India past 100. In spite of a good start, India's vice-captain could not continue and his departure was soon followed by that of debutant Hanuma Vihari's. Earlier, England who got a first innings lead of 40 runs consolidated their position on Day 4. Alastair Cook, who is playing his farewell match, scored 147 in his final innings and became the fifth batsman to score a century in his first and last Tests. Cook was aided by England's captain, Joe Root, who himself scored a century to help England set a target of 463. In Alastair Cook's farewell Test, England set a target of 464 ahead of India in order to give their best Test batsman a fitting farewell. But with Rahul and Pant adding more 166 runs for the sixth wicket before Tea, India needs 166 runs from the last 33 overs. If the two batsmen continue the way they are, India might create history in the final Test by chasing down 166.